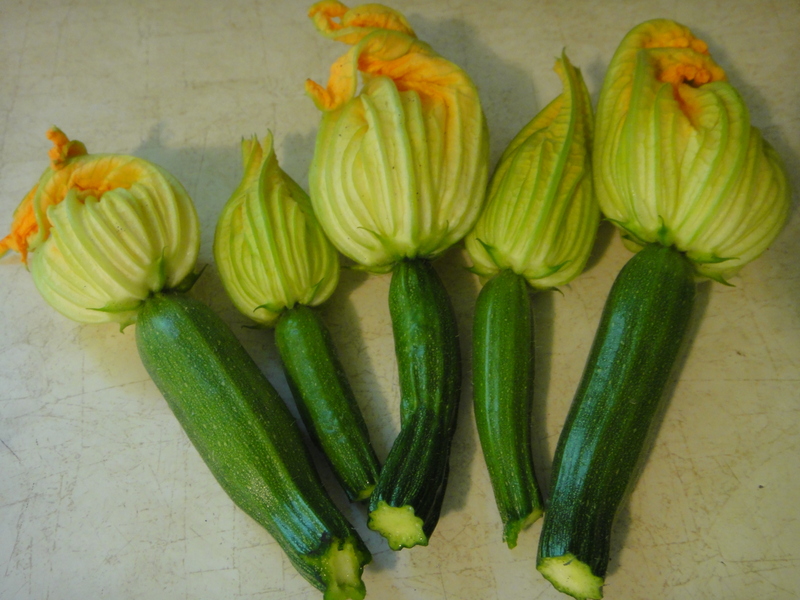 Stuffed Zucchini Blossoms… Now why hadn’t I thought of this before?! It’s such an amazing concept! 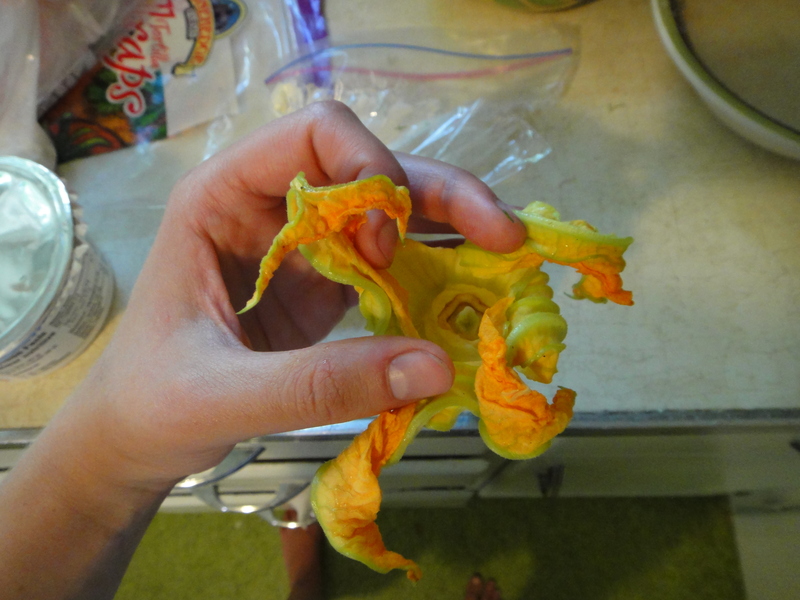 An edible flower, stuffed with whatever you want, then fried up and enjoyed with gusto. It’s a GREAT idea! 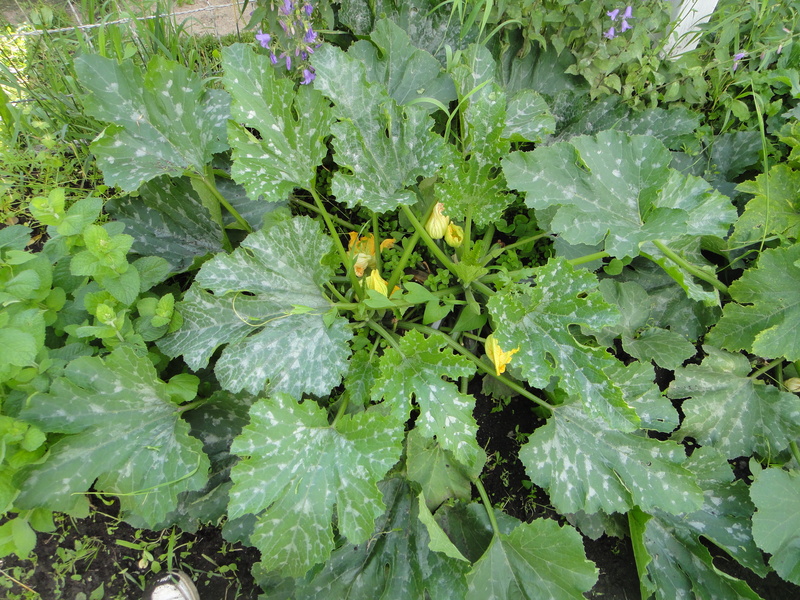 Here is my every blossoming Zucchini plant. It’s gotten massive over the summer with all this rain! 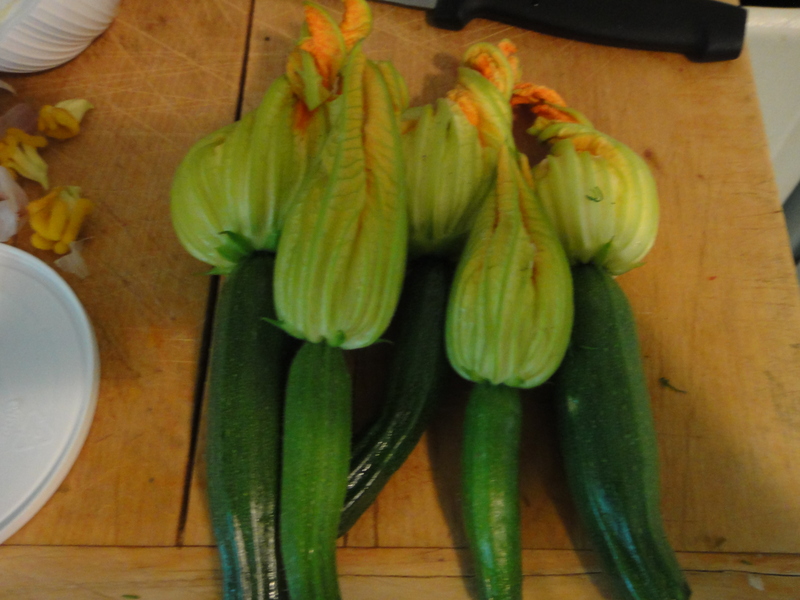 I picked some male zucchini blossoms, stems and all. 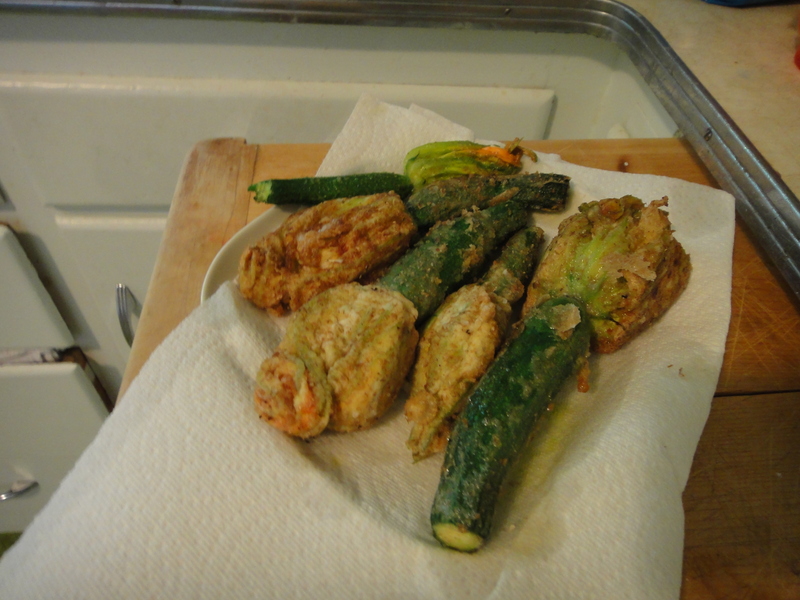 These would have eventually grown into zucchinis, but they work great for this recipe. The stems are very tender once cooked. 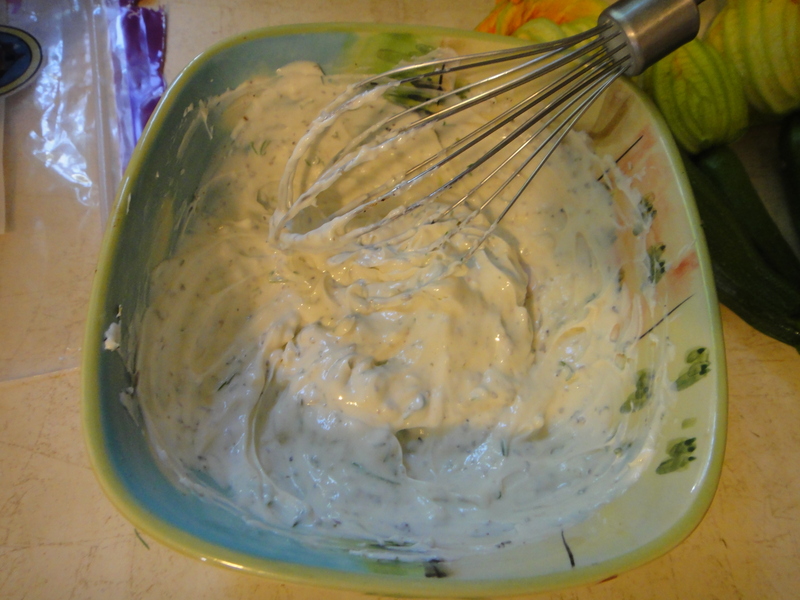 For the stuffing base, I mixed cream cheese, garlic and dill. I whipped then up nice and light. 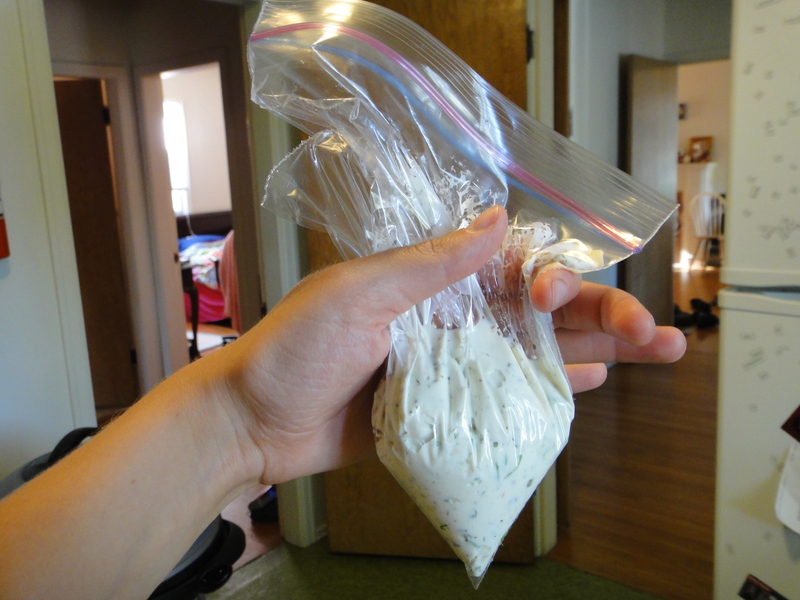 And put them together in a ziplock baggie, as a makeshift pipping bag. I opened up the stems a bit and pipped the cream cheese mixture until full. Then I twisted the ends and closed the blossoms, ready for frying. I first dipped the blossoms in an egg mixture. Then, I rolled them in a seasoned flour mixture. and fried them up in some canola oil. Here are the tasty blossoms, all ready to be gobbled up. I recommend you make extras. These disappeared waaay too fast! To clean and stuff flowers: snap stems off flowers, rinse well under cool water, carefully open each flower and remove insides. Set aside on dry towel to dry. 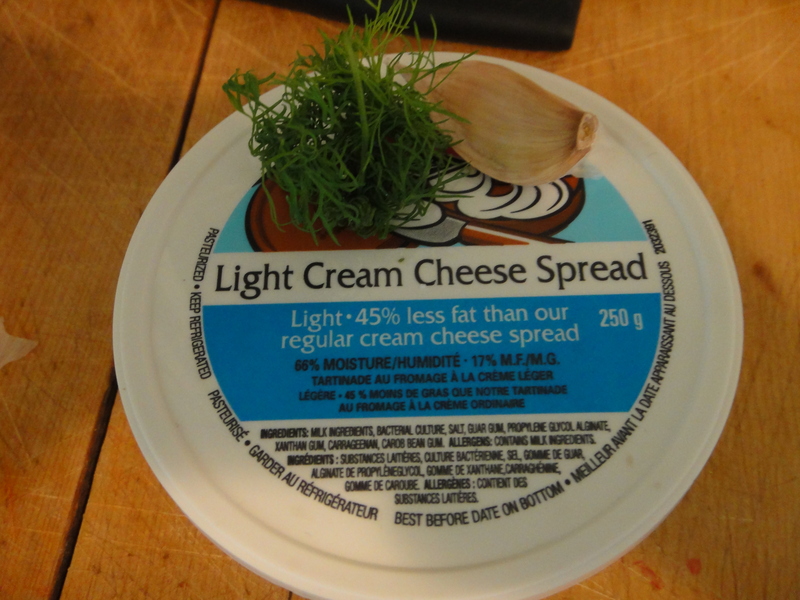 Once flowers are completely dry, carefully open and pipe cream cheese mixture into flower closing petals if you can. Use judgment on amount of cheese based on size of flower. Heat oil in large non stick skillet. 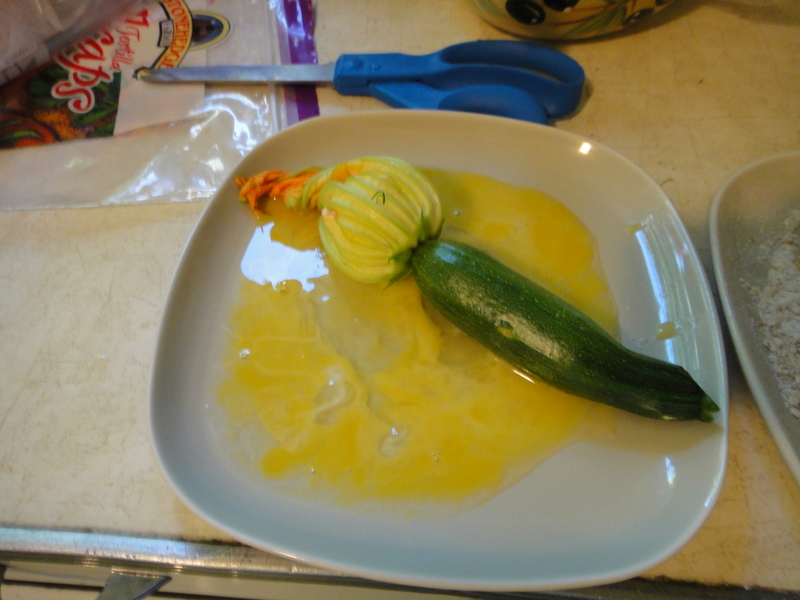 Using your fingers, carefully dip each stuffed flower into egg mixture and let extra drip off. 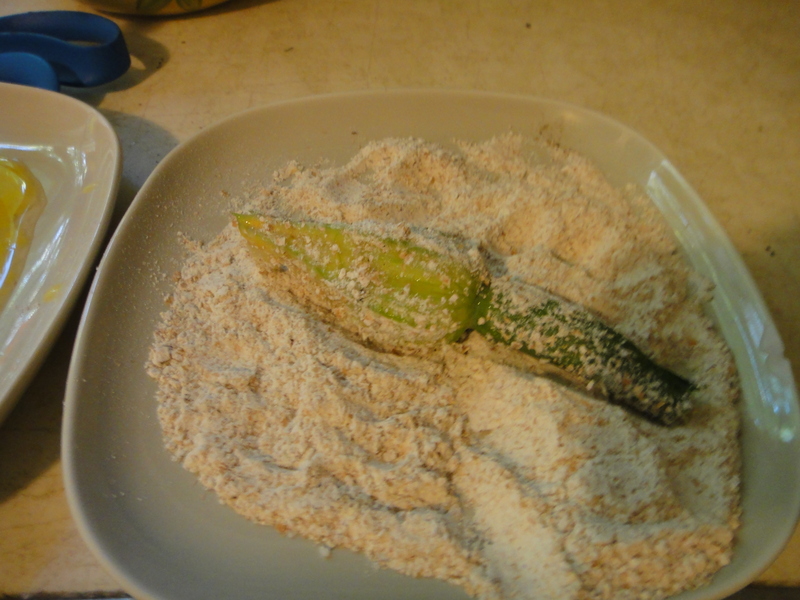 Place egg covered flower into flour mixture and gently toss to coat, shaking off excess flour. Place into hot oil. Continue on the next few flowers, amount depending on size of your pan, you don’t want to crowd them. 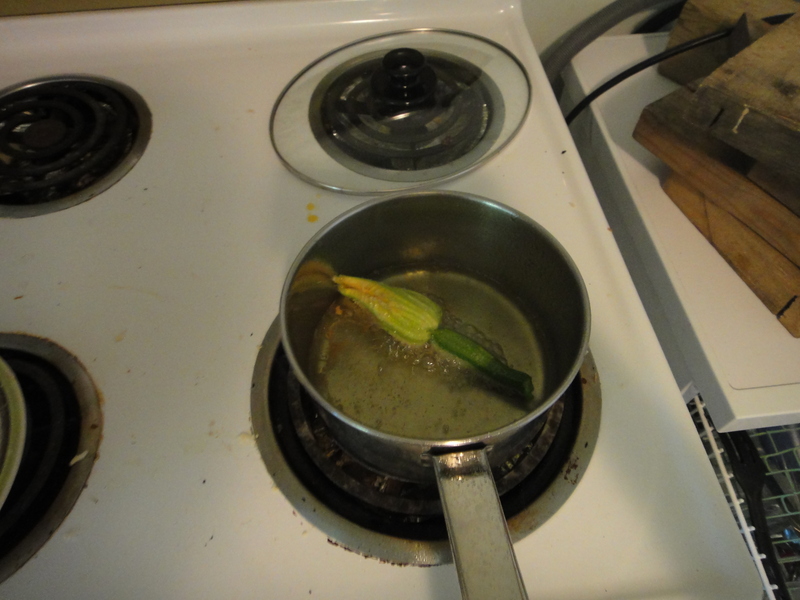 Once flowers are browned on bottom, about 3-4 minutes, carefully flip and cook other side. Cook for another 2-3 minutes or until browned and then take out and place on paper towel so that extra oil will be absorbed. Repeat until all flowers are cooked. You may have to carefully clean pan with a quick wipe from paper towel in between batches. This past weekend, I got the chance to take part in an amazing activity, a local foodie secret, if you will. 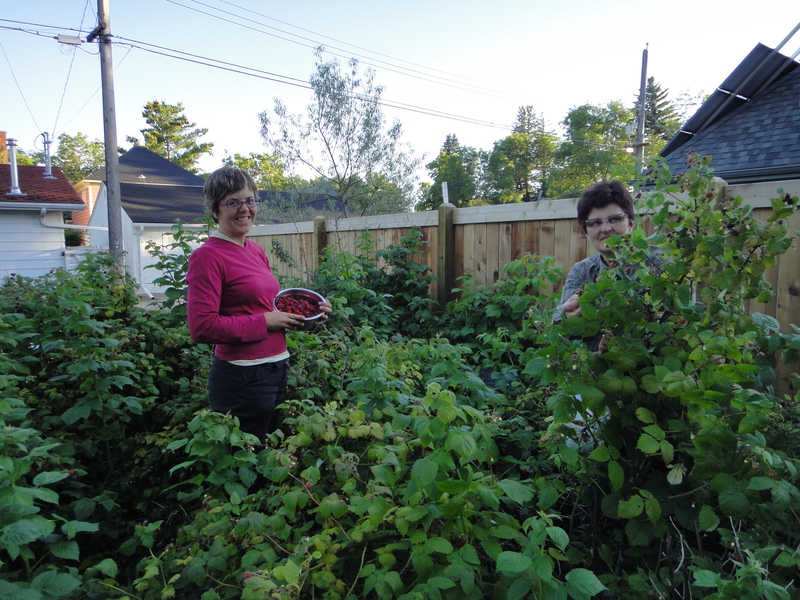 Operation Fruit Rescue Edmonton, an Edmonton non-profit, offers volunteer fruit picking opportunities in and around the Edmonton area. 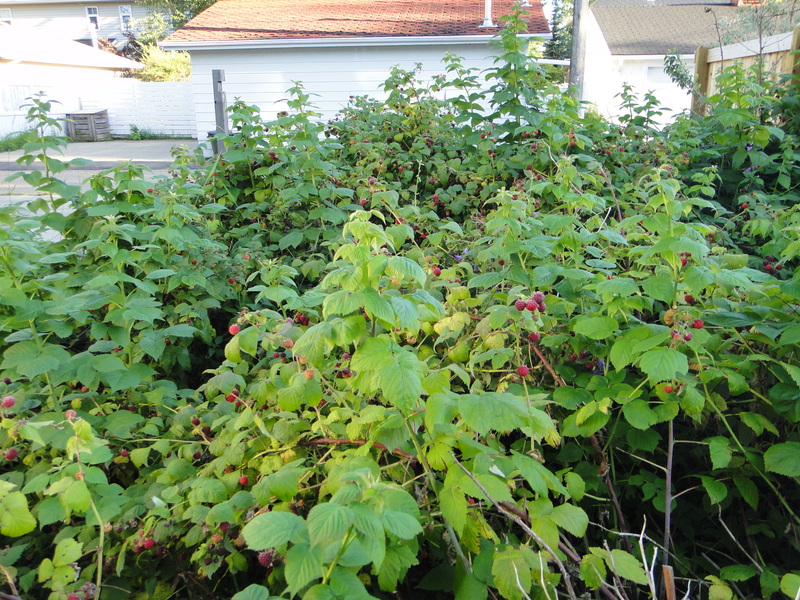 The gist of the operation is this: A grower will contact Operation Fruit Rescue Edmonton (OFRE) about a massive amount of fruit that has ripened in their yard, saying they either don’t have time or are unable to pick it themselves. Rather than letting the fruit go to waste, OFRE gets some volunteers together to go pick all of the fruit at once. 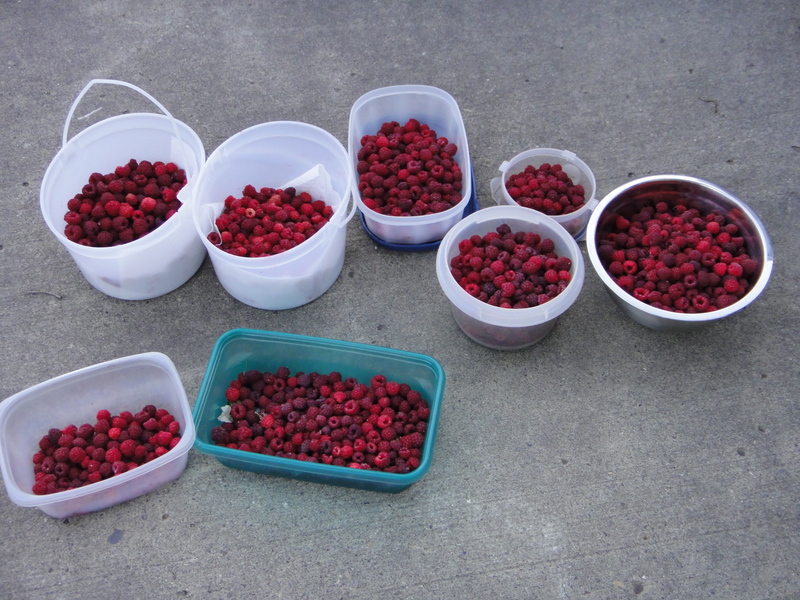 Once picked, the fruit is weighed, and divided up between all the pickers in equal shares, with an equal share going to the host, to the Edmonton Food Bank (or another charitable organization), and to OFRE for processing and preserving workshops. It’s genius I tell you!! 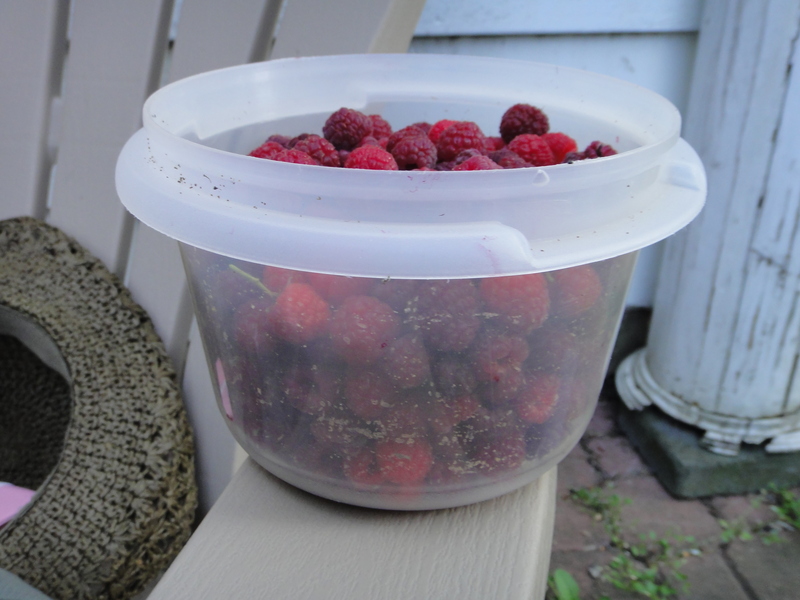 For about an hour of raspberry picking on Monday, I got to take home almost 4 cups of raspberries (Which are now nestled safe and sound in my freezer for some tasty baking adventure later in the year)! I was shocked that I got to take home that much, and incredibly grateful to OFRE for offering this opportunity. 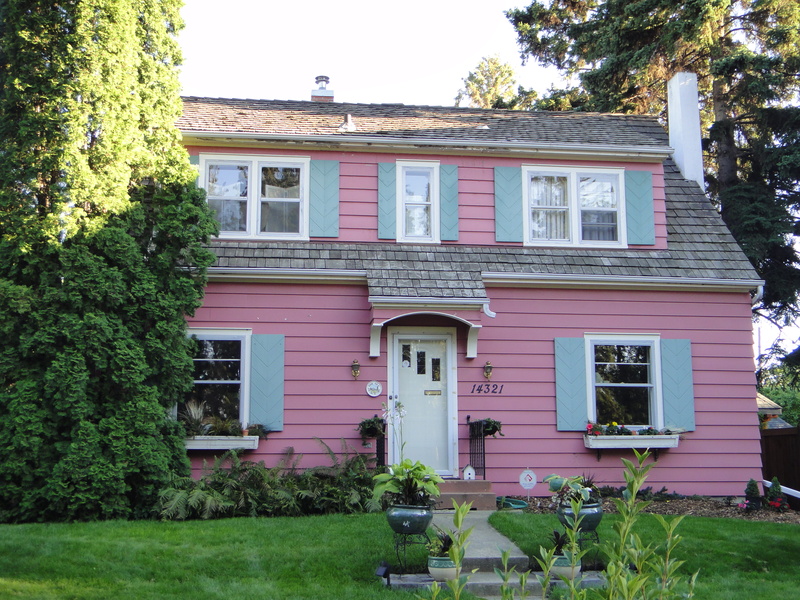 Here is the beautiful home of the host who offered up her raspberries. 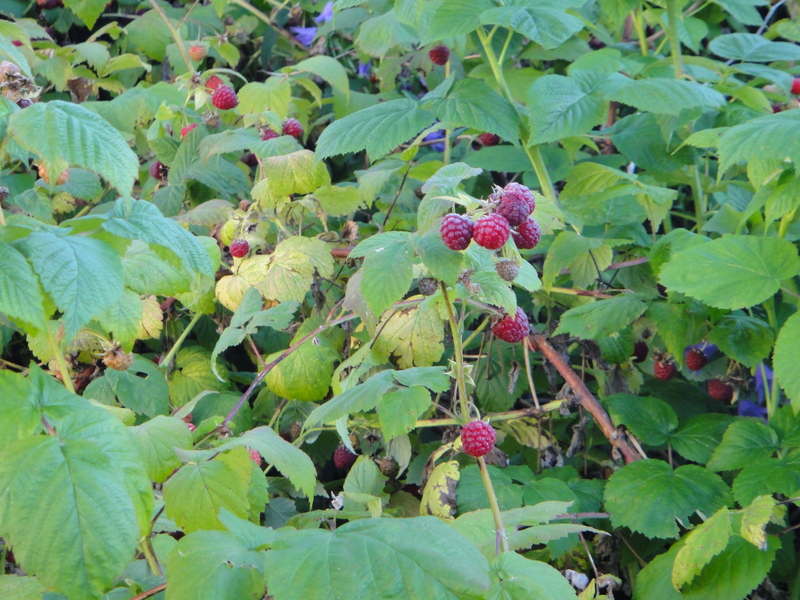 And here were her massive ripening Raspberry bushes! This is how much I managed to pick, in about 20 minutes. 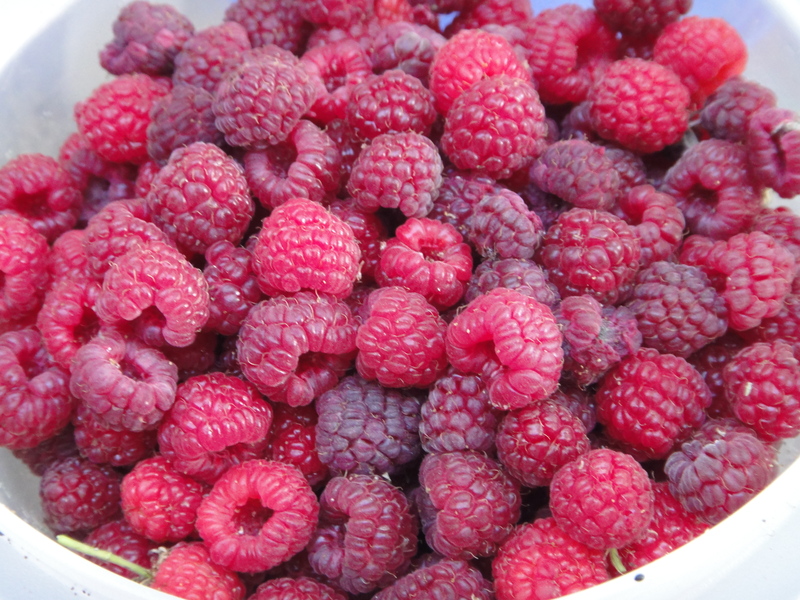 They were so ripe they would just fall into my hand! Here are my picking companions. 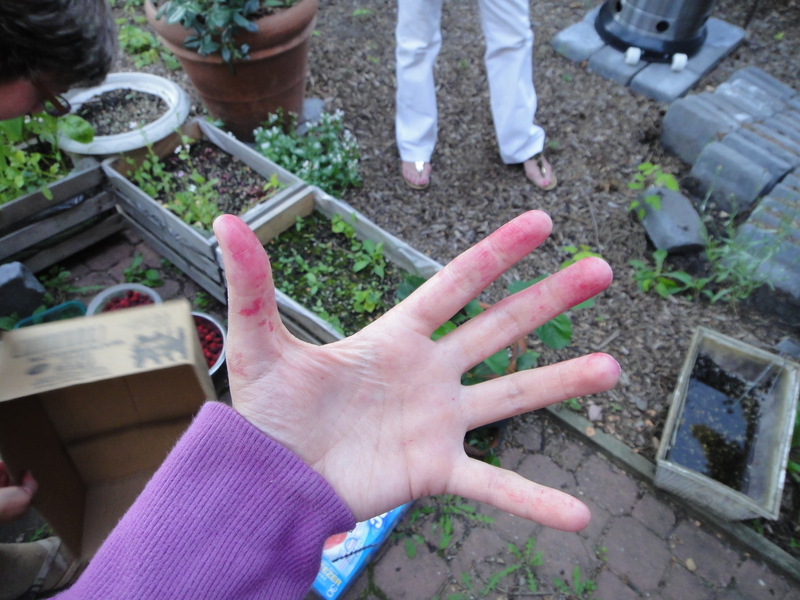 My fingers were very stained after we were all done. What an amazing evening! In total, we estimated that we picked about 20 pounds that evening. That a haul! 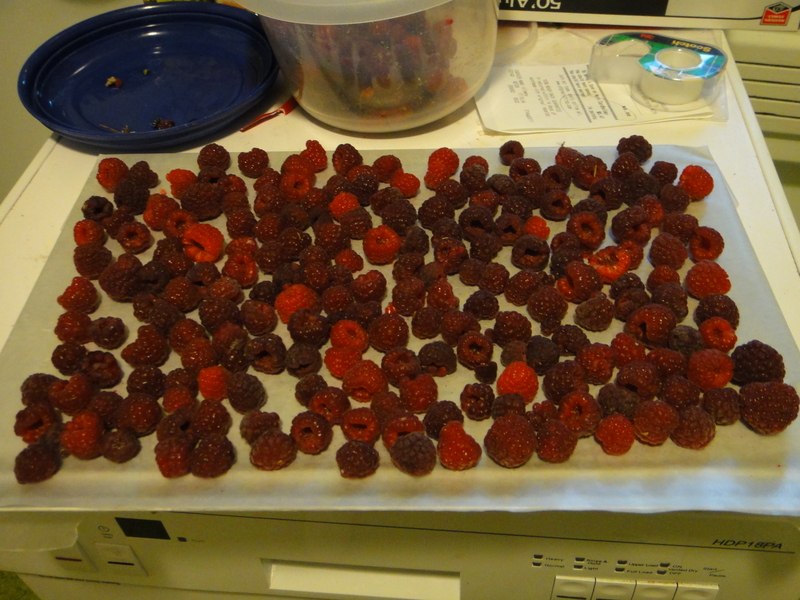 To freeze, I laid them all out on a baking sheet and put them in the freezer. They froze individually, without sticking together, then I put them in a ziplock baggie in the freezer for extended berry enjoyment!